The thing about professional football that renowned health-fad skeptic Timothy Caulfield finds most incredible isn't the feats of athleticism, the big hits or even the moments of grace that emerge from the chaos—it's the pre-game stretching. 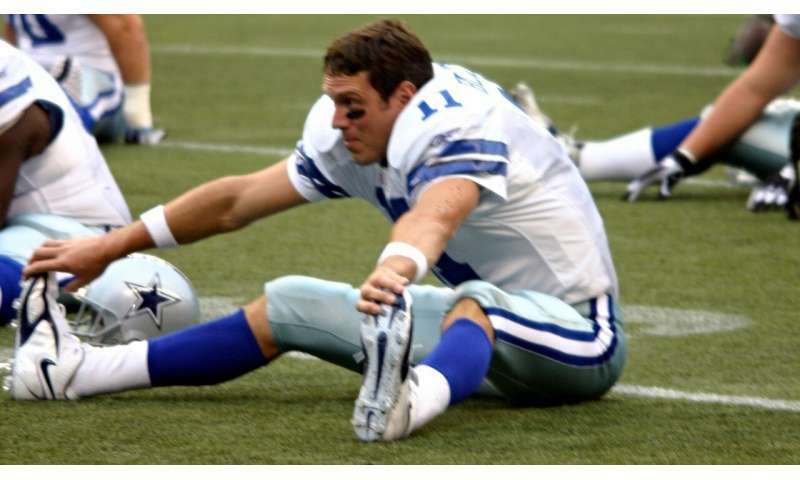 "The research shows these million-dollar football players might be increasing their chances of injury and probably decreasing their performance capabilities, and yet there they are doing static stretches," said Caulfield, a University of Alberta health law professor and the host of "A User's Guide to Cheating Death." "If the myth lives on in that atmosphere, it's no surprise it lives on in the public more broadly." "I'll talk about it to the general public and people almost refuse to believe it—it feels good, it has intuitive appeal, people like to believe it works—but the big-picture bottom line is the evidence concerning static stretching is way more equivocal than people realize," said Caulfield. However, if you aren't flexible enough to perform the task properly, he said static stretching might not be a bad idea. "It may mean you are a little bit weaker, but you're probably better off doing something correctly and giving up a little strength than not being able to do something correctly and having all your strength," he said. Chiu added there is some evidence that people with less ankle flexibility have a higher risk of getting jumper's knee or an anterior cruciate ligament (ACL) injury. "If I'm working with someone who is at risk of those types of problems and theoretically I could reduce their risk of injury by stretching, I recommend that they stretch," he said. "You might be weaker, but if it allows you to do the exercises better, theoretically that would mean you would adapt better than if you were to do the exercise improperly." "Weak muscles may be overused and stiffen up, but strength allows muscles to be more pliable," he explained. Chiu's team found that ankle flexibility increased in study participants who strengthened their calf muscles compared with those who just stretched them. "That feeds the theory that when a muscle is very strong, it can relax when it is called upon, as opposed to a muscle that is always working very hard that will tighten up and prevent the joints from going through their full range of motion," he said.